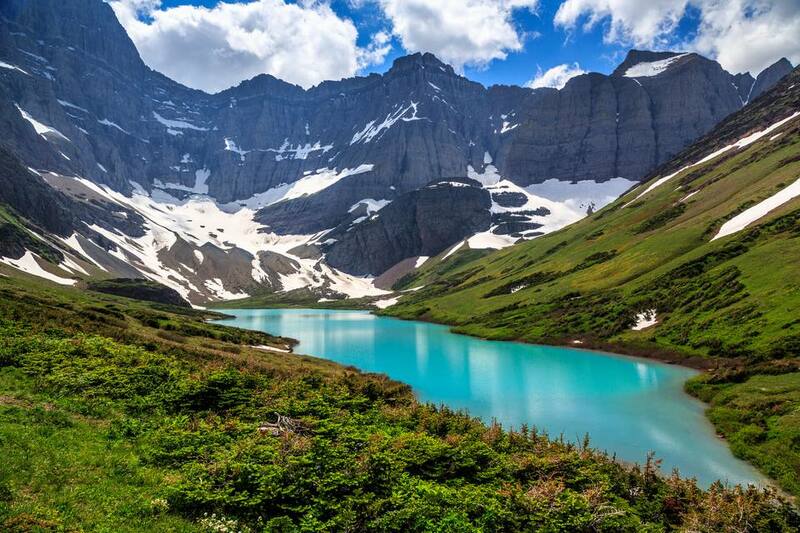 Visitors to Glacier National Park will be treated to all kinds of amazing scenery, from jagged peaks to mirror lakes to wide blue skies. This scenery can be enjoyed on a drive, from a boat, during a hike, or while sitting on the porch at one of the park's historic lodges. Because Glacier National Park preserves a convergence of different ecosystems, varying in moisture and elevation, the views are diverse and ​ever-changing. Glacier National Park is part of Waterton - Glacier International Peace Park, which was designated a World Heritage Site in 1995. The World Heritage Site designation recognizes places that are considered natural or cultural treasures of the entire planet. There are so many things to see and do in Glacier National Park, you'll want to visit more than once. Your first visit will assuredly leave you with memories to last a lifetime. Here are some of the most popular things to do in Glacier National Park. The Going-to-the-Sun Road runs east-west through Glacier National Park, crossing the Continental Divide at 6,646-foot Logan Pass. Along the way, it passes through some truly amazing scenery, from glacier-carved lakes and valleys to rocky peaks and snow-topped mountains. There are scenic turnouts, hikes, waterfalls, and views galore. The Going-to-the-Sun Road, which is 50 miles long, runs from the western park entrance at West Glacier to the eastern entrance at St. Mary. Note: Whether you drive it yourself, or take a shuttle or Red Bus tour, the Going-to-the-Sun Road is the thing you want to do if you only have one day to spend in Glacier National Park. While everything along Glacier National Park's Going-to-the-Sun Road is wonderful, there's a lot more to see and explore. The Many Glacier and Two Medicine regions of the park are also popular places to visit, offering abundant scenery and recreation along with visitor services. For those who truly want to get off the beaten path, the remote North Fork and Goat Haunt regions will provide all the wilderness solitude and natural beauty you could desire. While you can see plenty of amazing scenery from the road and your car, you'll definitely want to get out and experience nature first-hand. Hikes in Glacier National Park range from flat, easy, ranger-led interpretive hikes that are wheel-chair accessible to challenging back-country trips that only the most rugged should attempt. Here is a sampling of the most popular hikes in Glacier National Park. Trail of the Cedars: Accessed near Avalanche Campground, this 0.7-mile accessible trail passes through old growth forest along Avalanche Creek. Hidden Lake Overlook Trail: Wildflowers and panoramic views make this 3-mile-round-trip trail a must-do. The trailhead can be accessed from the Logan Pass Visitor Center. Highline Trail: Also accessed from Logan Pass, this high-elevation trail affords stunning views. Most visitors can sample the first few miles of Highline Trail. Hearty and experienced hikers choose to tackle the entire 20 miles (one way) of this gorgeous trail. Running Eagle Falls: Short and accessible, this Two Medicine region hike takes you to the extremely picturesque Running Eagle Falls. Developed as major stops along the Great Northern Railroad, the lodges at Glacier National Park are grand examples of park architecture. Even if you don't stay there, it's fun to explore them inside and out, from the lobbies to the gift shops to the great porches. Lake McDonald Lodge: This Swiss-chalet style lodge sits in a magnificently scenic location on Lake McDonald. The lodge's spacious lobby has huge log beams, a grand stone fireplace, historic furnishings, and hunting trophies from the lodge's first owner. Tours and Ranger talks are available. Many Glacier Hotel: The view of Swiftcurrent Lake and the surrounding peaks from the porch at Many Glacier Hotel is so gorgeous, you'll want to plant yourself and never leave. On your way to that charming spot, check out the hotel's lobby, where you'll find historic paintings, a copper-capped fireplace, Mission-style furnishings, and log structural elements. Lake McDonald: Hour-long cruises leave from the boat dock at Lake McDonald Lodge. St. Mary Lake: Narrated boat tours are available with and without a guided hike. Swiftcurrent & Josephine Lakes in Many Glacier: Departing from the dock at the Many Glacier, this scenic tour requires a brief hike between lakes. Lengthy hike add-ons are an option. Two Medicine Lake: This boat tour focuses on Blackfoot Indian traditions and can include the chance to hike. Packed with lakes, rivers, and streams, there's plenty of opportunity for watery fun in Glacier National Park. Boating and paddling are allowed on Lake McDonald, St. Mary Lake, Sherburne and Lower Two Medicine Lake. If you bring your own boat it must pass a quick inspection for invasive species. Motor boats, rowboats, and canoes can be rented at Lake McDonald and at Lower Two Medicine Lake. The fishing isn't the best in Glacier National Park, but it's still a relaxing way to take in the scenery. Species you might catch in lakes and streams include cutthroat trout, northern pike, whitefish, kokanee salmon, rainbow trout, and lake trout. Whitewater rafting and float trips are available on the Middle Fork and the North Fork of the Flathead River. Rafting guides and outfitters all operate from the town of West Glacier. Some guided raft trips are combined with hiking or horseback riding. Visitor centers are great places to stop, orient yourself, and learn more about all the things you'll see during your day in Glacier National Park. Visitor centers are located near the park entrances at Apgar and at St. Mary, as well as up at Logan Pass. Expert rangers can fill you in on current conditions and ranger-led activities, and make recommendations regarding hikes, campgrounds, and other outdoor recreation opportunities. Each visitor center has a selection of exhibits covering such topics as park geology, animals, or wildflowers. These visitor information centers also sell books and maps and have restroom facilities.